A new year and a new you, right? It's easy to set goals for yourself, but the challenge is keeping them in sight. Pass the wine ~ Share your chocolate with me ~ I’ll do it tomorrow ~ Just one more episode on Netflix ~ Ten more minutes of sleep ~ One more cup of coffee ~ I walked all day I don’t need to exercise ~ This has dairy so it’s healthy, right? Alright, alright I am guilty of all of them, what about you? Do you catch yourself saying any of these regularly? It’s now the beginning of 2018 and I have sat down and made my ever-growing list of things to do and changes to make in my life. 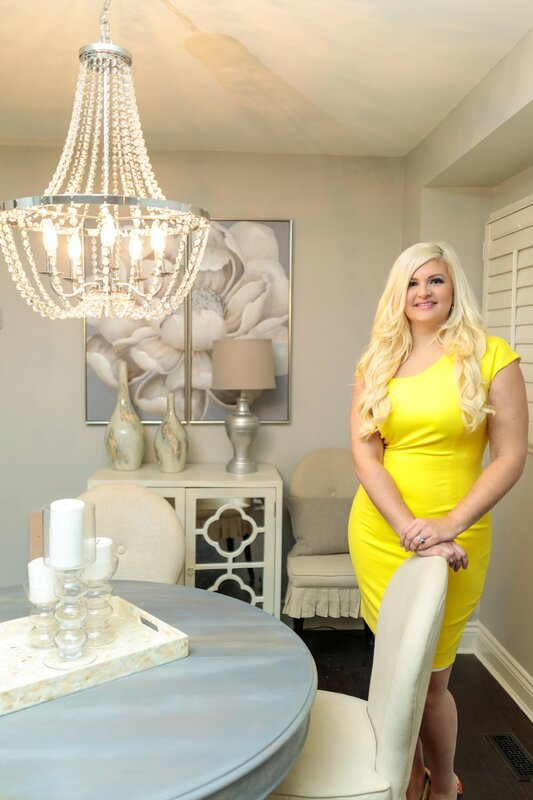 Let’s admit it, if your list is anything like mine and you are a go-getter you probably find yourself trying to focus on a million things at once like your business/work, home renovations, family, friends, social gatherings and oh my goodness you still need an outfit for each engagement! Don’t panic, while I share a few of my New Year’s resolutions with you I am also going to give you some new ideas on how to improve the cold wintery days ahead. Before we jump into a few of them it’s important for you to get organized and get your goals on paper. If you are a visual person like me you can do a VISION BOARD. Studies show that keeping your goals in sight increases your chances of achieving them, so I decided it was important to get my staff together to create our individual vision boards. We touched on both personal and business aspects of our lives and I know by creating a hard copy of our goals and sharing with others we will hold ourselves accountable, and will help keep each other on track! I loved having a chance to craft over tea with my ladies and chat about the exciting year ahead. If you still aren’t sure what a vision board is click here to hop over to my Pinterest for a bit more visual inspiration! One of my larger goals is something that I feel like many of you can relate to – I want to get healthy, eat right, exercise, and lose this extra 40lbs (yes, I know I am setting the bar high, but you know me – I’m a go-getter!). I’m excited to say that I have joined Weight Watchers (for anyone reading who is also a part of the online support system my connect link is: thepediaries), and look forward to the positive changes that it will bring about in my life! I’m ready to commit, focus, and share the ups and downs of my journey with you all. So, if you’re like me and looking for ways to increase your activity levels – read on. I know sometimes this time of year it’s difficult to make yourself go outside any more than necessary, but fresh air and a bit of exercise can go a long way in improving your mindset and providing some quality family time. It may be chilly out – but find ways to keep moving so you stay toasty warm! A personal favourite of mine is a little retail therapy. You might be thinking “Liz, really,” but did you know the average person burns up to 200 calories an hour shopping? – YES PLEASE! And don’t forget the Oshawa mall has now expanded and it is perfect for laps. Don’t worry, I get that shopping might not be the best option for your family so here is a few local ideas: Go ice skating (indoor OR outdoor)! If you live in the Durham area have a look at the City of Oshawa skating schedule. You could also go snowshoeing or find trails to walk through this beautiful winter wonderland! I bet you didn’t know there are over 350km of trails in and around Durham. If snowshoeing is a bit tame for your liking and you would rather head over to the hills for a bit of local skiing or snowboarding, Brimacombe is officially open! Not sure how you would fare on a pair of skis and a little bit nervous for your kids to give it a go? You’re in luck as January is Learn To Ski & Snowboard Month at Brimacombe and they are offering some incredible deals for the family! Most of us know that Canada has really been laying on the cold weather these past couple of weeks so maybe it isn’t so easy to get the kids out of the house? I may not be a fan of regular video games, but a Wii is something that the kids LOVE and can offer fun for the whole family without ever leaving your living room! As a bonus, it’s a great calorie-burner (as long as you aren’t playing it with a side of chips and chocolate!). Do any of you find yourself going through the Tim Hortons or Starbucks drive-thru every day?? I have certainly been guilty of this, but this is going to be my year where I cut back on this, and give up those REALLY yummy french toast bagels from Tim Hortons (I can’t believe I am saying this,) for the benefits to my health AND wallet. Take a moment to think just how much you would save by breaking your fast-food and coffee-on-the-go habits. Convenient options sure can be tempting, but they do not benefit you in the long run. This year, I will be focusing on meal prepping at home to help me resist ordering that muffin or bagel - which may look innocent enough, but sure packs on the calories quickly! How many of you have that pair of jeans in the closet that you keep telling yourself you'll fit back into one day? Well, I am really looking forward to kissing these pounds goodbye and fitting back into all my beautiful dresses, but also because I look forward to feeling better all around, and you can too! Consequently, I need to find replacements to keep my health goals on track. Here are a few meals that I am excited to try in 2018 and if you decide to give them a go as well then send me a message and let me know which one was your favourite! So now that the kids are taken care of and our bellies are full it’s time to focus on YOU and your partner. Everyone knows that life can be hectic over the holidays and even when you go to a party together it usually ends up with you talking to all your girlfriends and him hanging with the fellas. So ask yourself when is the last time you guys had some romantic one-on-one time with no kids and no technology? I am not talking about the 20 minutes in bed that you had before passing out from exhaustion, or the couple hours you spent running errands and having a quick lunch somewhere. Are you struggling to come up with an answer? If so, it’s time to organize a date with your man or woman, so put your phone down, have a shower, do your hair and dress accordingly to what you have planned. I think sometimes we assume a romantic date will take a lot of effort, time, or cost too much (especially if your pockets are a little empty from a pricey Christmas), but this is not the case. 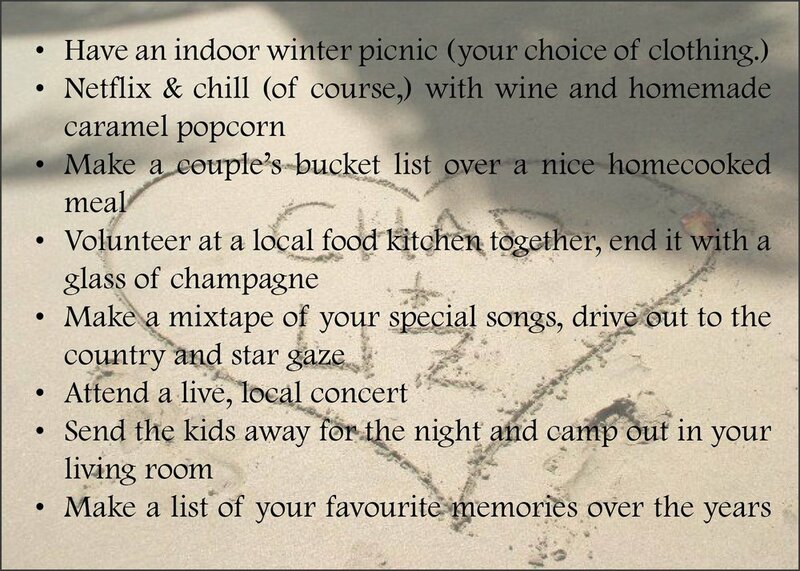 The most important part of a romantic date is quality time so I want to share with you a few low cost date ideas. My plans to grow my business and give back to the community are very important to me, but this year I am going to make a tremendous effort to work on myself as well. Without a healthy, happy me it is unrealistic to think that I can achieve all of my business goals running on low fuel – and the same goes for you! So this year on top of eating well, drinking more water, and doing my best to get enough sleep, I am going to make it a priority to take a vacation with my family and maybe even find a bit of time to plant a few flowers this summer while sitting in the sun with a crisp glass of Chardonnay. I pray this year is a prosperous year for you all and wish you nothing but blessings and happiness in 2018. Even though Jack Frost and I are not friends, I will always LOVE and look forward to the joyful Christmas season! First and foremost I love to remember what the season truly means, like keeping the celebration of Jesus alive and always keeping the “Christ” in Christmas! Secondly, even though presents can be fabulous, the best gift I am given at this time of year is time with my family and lots of festive get-togethers with our friends (just think of all the mulled wine we will drink this month!) There really are so many traditions to look forward to such as, the girls building a snowman, baking delicious treats or Chad and I finding a quiet moment under the mistletoe. Now, back to the gift giving for a quick second. I wouldn’t be staying true to myself if I didn’t admit that holiday shopping for my loved ones is a real treat! In fact, I wonder if Saint Nicholas is hiring for a personal shopper? Before I get to all of those wonderful presents there is something I have been working on for a few weeks now and I am ready to share my Christmas décor tips all wrapped up in a pretty bow, just for you! Thanks Shelly for the inspiration! Fortunately for me, plaid has made a huge comeback, and particularly red and black buffalo plaid! I certainly didn’t lack for options when choosing my holiday décor! Black, red, and white (of course!) is scattered throughout my home and I’m excited to share my photos and tips with you all! I absolutely love all of the Christian signs that I have been seeing this year. I feel like we are surrounded by the true meaning of this holiday and it warms my heart to know that it hasn’t been forgotten! As for decorating your home, I love that you can have fun with the holiday season and bring the outdoors indoors! Go on an adventure, or take the kiddies outside and forage! Have the kids hunt for various sizes of pinecones, bark, and pieces of fresh greenery such as pine and fir tree branches. These items can be added in throughout your home whether it’s added to a decorative bowl, on top of your fireplace, around your festive family photos, etc.! Get creative with it! Real greenery is easy, visually appealing, and bonus - it’s free! And if the kids end up going overboard with the collecting and you have bags and bags of leftovers the BONUS is that there are a ton of incredible Christmas craft ideas that will solve that problem! Leftover greenery can be used for gift-wrapping, a foliage wreath, candle decoration, and so many more that you can check out on my Pinterest! Click here for my favourite Christmas crafting ideas for extra foliage! If you’re like me and like to decorate at least a month before Christmas, use these tips to keep your greenery looking and smelling fresh – all season long! Click here! The living room or family room is easy to season up, pick up a couple wintery pillows or a cozy throw in your theme colours. Candlesticks are my favourite, and I sprinkle them everywhere! An easy holiday hack is to glue ribbon onto plain candles you may have lying around to instantly add oomph to an otherwise bland item! As mentioned above, you can also add in a piece of foliage for something extra eye-catching! Add bows or Christmas ribbon to existing wreaths or art! Vases you use all year round can look like a whole new addition once you add some seasonal flowers (real or fake!). In the kitchen, new placemats and napkins can go a long way in dressing up your table. I couldn’t stop there though and opted for red dish clothes and hand towels as well! A room that is often neglected is the bathroom – don’t forget the holiday towels and soaps (my favourite is the Winter Cranberry,) in your guest bathrooms to really have a touch of Christmas throughout your home! This brings us to the biggest and most dramatic Christmas accent of all… the tree! When decorating mine I focus on layering. I add the ornaments first, and then add all of the fun items I stock up on at the dollar store, such as feathers, ribbon, glittery foliage, etc.! Adding these items in, some closer to the forefront, and some further back within the branches adds texture and colour to the overall effect (plus, if your tree is fake and looking as if a few too many branches are missing this will do the trick.). Try not to over think it, and add it to your tree without rhyme or reason, as the result will look effortless and not overdone. Another holiday hack is to purchase and (beautifully!) wrap gifts as early as possible to 1) Save yourself the stress of last minute shopping and 2) they act as picturesque decorations up until the morning of the 25th! With so many bag and gift-wrap options these days it’s easy to keep stay on theme and allow your perfect packaging to steal the show! As for the finishing touch on your holiday home… don’t forget the mistletoe! May it be a reminder to plant a smooch on everyone you hold dear, and spread the love this holiday season! A HUGE shout out to my favourite stores for helping me create this beautiful Christmas setting! Follow the links to start shopping for your festive favourites. Canadian Tire - The best tree a girl could ask for! Book clubs are fun and all ~ but I prefer to read wine labels! If you’re with me on this, carry on for my tips for a successful vino club! So why is endless rosé and a group of fabulous ladies a delicious mix? Because you never know where the night will take you! I mean this quite literally – because last weekend when I hosted wine club we noticed some strobe lights in my neighbourhood and ended up crashing a karaoke party! Now THAT is something I wish we had documented with pictures, I would share more but what happens at ladies night, stays at ladies night. Other than the fact that wine tastes great, makes you feel wonderful, AND helps bring all the juicy gossip to the table… it also has a way of de-stressing your soul! I mean - have you ever come home after a long, hard day and you have been thinking about that crisp white wine (I’m a white girl personally!) touching your lips…anticipation building… the whole way home?! I love you wine! Now I get to bring my girlfriends into this monthly mix and we have a recipe for a party! Let’s get this night started! Pick 8-10 women maximum – you need to keep it at a manageable number so you get the most out of it! Pick friends that live close – distance can end up being a deterrent and the club can fall apart. I also mainly say this point because after a wonderful evening your guests need to get home safely which is likely by cab. Unless you plan to turn it into a full blown slumber party - then distance really doesn't matter. Is It Your Turn To Host? Once you establish a core group of people who are more than willing to wine and dine monthly – you get to come up with THEME ideas! This is where you can be as creative – or simple – as you like! Let the creativity flow - depending on the amount of time you have to prepare you could help these ladies unwind by teleporting them to a new place! Not only do you match the wine and food but also the decor and outfits. Who wouldn't like a romantic, fashionable evening in Paris or a wild and spicy evening in Africa? WARNING - this night might end in hugs, tears and a lot of "I love you so much!" You must all bring a bottle that is dear to your heart. Think deeply about it, was it the bottle of wine you were drinking on your first date with your partner, or maybe it's the Prosecco you and your girls got WAY too tipsy on at your graduation - whatever the story - be prepared to share the juicy details! Being a natural-born party planner (excuse me while I blow my own horn here,) I love SWAG so this time around I presented the girls with a little 'thanks for coming' gift - our very own “Surviving Motherhood One Sip At A Time” glass, (in pic above.) I am sure all you mama's out there could agree with this one! As for my friend Lisa, she is such a hard worker and always on the go so we presented her with this awesome 'Thank God it's Friday' glass, and she absolutely LOVED it! Wine club can be as casual or as proper as you’d like it to be. If you’re just there to sip at all the wines and continuously proclaim them all to be delicious – so be it! Sip away girlfriend! OR if you’d like to be able to properly use the term “flamboyant” when referring to a wine – check out this handy list of wine descriptors! Now for the part we love most, tasting the wine! Yes, many o9087c f you know how to taste, sip and swirl your wine away but for those (like me) who still need a bit of guidance have a look at the handy guide below! Amidst the motherly tasks, wifely responsibilities, demands of work, and the toll of hectic day-to-day life - Wine club is that opportunity once a month to socialize, catch up, and let our hair down. Laughter truly is the best medicine – and there’s no shortage of it at wine club. So whether your party is bright and elegant or completely unoaked I hope it is special! AND - as a little thank you for reading my blog I have included a FREE wine tasting printable for you to use! I’m a bit bitter about having to pack away my summer dresses now that the temperature is dropping, but I love this season for the salted caramel lattes, tall boots, beautiful scarves, and the excuse it provides to curl up in that warm fuzzy blanket! After the prolonged summer we were blessed with it’s finally beginning to feel like fall – just in time for THANKSGIVING! As we all know, fall is that magical season where everything takes on that golden glow… it’s that happy place before another Canadian winter swoops in and we’re reminded JUST how awful shoveling is! This weekend I am lucky enough to be hosting 20 family members, and while it’s always fun… sometimes it also feels like the pressure’s on! Where will I put everyone? Is there a seat for each RSVP’d bum that will be in attendance?! How will I set the table? Let’s start with my favourite part… the holiday décor! Don’t worry - I like to keep it SWEET & SIMPLE. My biggest tip? Work with what you have, girl! Use what you have, and then ADD, LAYER, and have FUN with it! You may already have plain white napkins, plates, or charger plates – and then just pick up a few holiday-specific items as the accent. I love simple/ white dinner plates so that I can add my splashes of colour elsewhere throughout the table – maybe a statement centerpiece, or quirky napkins! NOTE: Stick with colours that match your décor – NOT the season! I already had orange decorative pumpkins from Dollarama – and after a quick spray paint – voila! 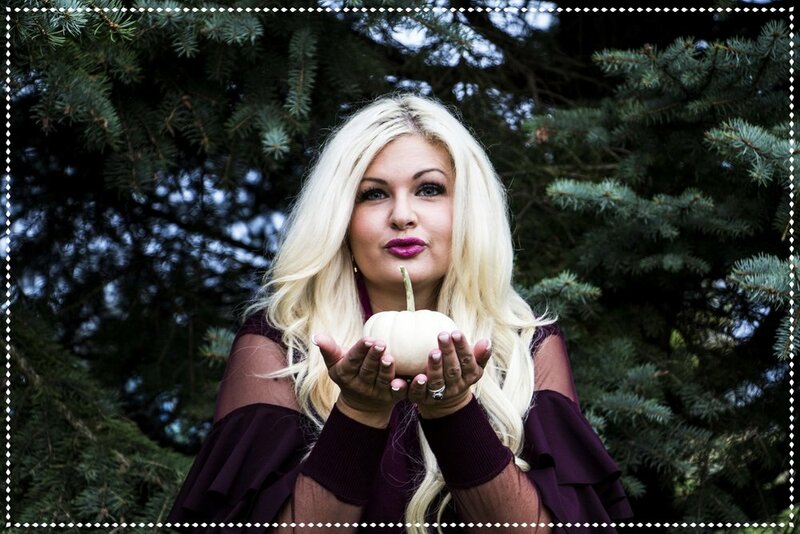 - beautiful (and décor-matching) white pumpkins! I picked up a brown wicker cornucopia from Michaels and a quick spray later – my centerpiece is ready! Candle Centerpieces: A Value Village steal! So that sums up the non-edible components on my Thanksgiving table, but what about the part we ALL love - the feast!! Chad’s parents are from Newfoundland, and for those of you that don’t know – along with that comes a very specific “Newfie Dinner.” There’s bound to be some laughs along the way as I attempt to make my mother-in-law’s JIGGS DINNER for the very first time! My favourite part of the Jigg is the blueberry dessert that is cooked right alongside the rest of it in the pot! The Newfoundland berries my mother-in-law picked will be the perfect touch. As for the vino – my all-time favourite Chardonnay by Closson Chase (a Prince Edward County gem) will be gracing my table! So excuse me while I start preparations for my first Newfie Jigg – there’s a glass of wine calling my name. So wish me luck, and I wish you all a Happy Thanksgiving! Sign up with your email address to receive news, invites, contests, latest blog posts and some of my favourite design tips and tricks! We respect your privacy and would NEVER share your information!